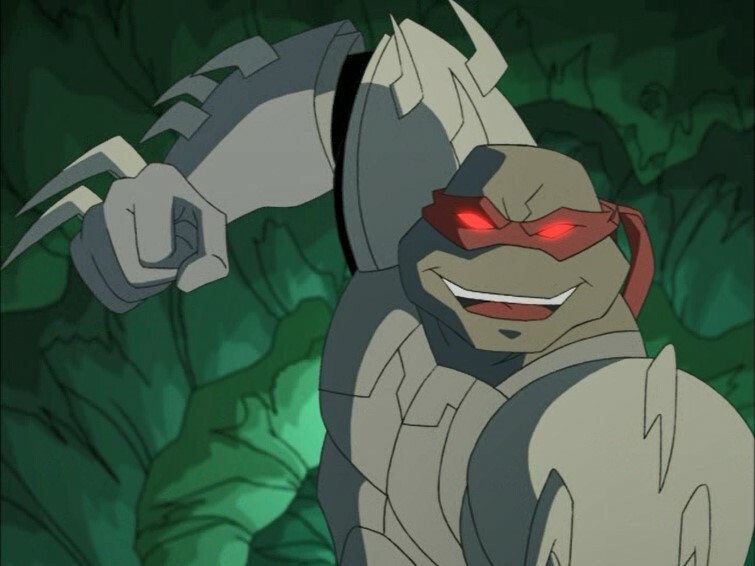 TMNT Entity: TMNT (2003) Season 3, Part 3 review at AIPT! TMNT (2003) Season 3, Part 3 review at AIPT! Head on over to AIPT for my latest review of the 4Kids TMNT cartoon! This batch of episodes debuts Nobody to the 4Kids TMNT continuity, as well as Dr. Chaplin who is even more of a nobody than Nobody. I'd say the highlight of this bundle, though, is the crazy Call of Cthulhu parody episode that doesn't pull any punches. They went for it and they went all the way. Gotta respect that. The banter between Shredder's minions in Season 3 was one of my favorite aspects. At this point of the series Shredder is now fed up with Hun and not just Baxter, and both Hun and Baxter are constantly scheming throughout the season, trying to get rid of Karai or Chaplain, double-crossing each other, etc. to get on Shredder's good side. I found it pretty funny and they had great chemistry, along with Chaplain trying to crush on Karai (which actually becomes a canon ship by the end of the show, surprisingly enough), and Karai and Hun hating each other. At this point it does feel like Hun and Baxter essentially become the "Rocksteady and Bebop" of the 2k3 series with their constant failures and Shredder getting mad at them at the end of every episode. But this only goes to the end of Season 3, as Ch'rell is done away with and Hun and Baxter then become their own bosses and move out on their own. Still it's fun for this final season with Ch'rell as we never see him return till Turtles Forever. "...it's going to sound like Goku doing a Batman impression..."
That pretty much what Schemmel does already when he's voicing one of Goku's "advanced" forms. Indeed about what the first commenter said, as the Foot villain "fellowship" would reach its zenith, this season. I think my favorite dynamic is Chaplin/Baxter, because of Chaplin's almost adorable obliviousness to Baxter's thinly veiled contempt toward him. Even after everything, he did not held any serious grudges toward Baxter's various attempts at sabotage. I had a lot of issues with the Season 5 finale, but seeing Chaplin almost squeeing to work with Baxter again, and Baxter rolling his eyes in response, that was a well-needed palate cleanser for me. This batch of episode reviews I'm especially grateful for, as I honestly don't recall seeing the Darkness Within when it first ran, last decade. I totally blanked out that Angel had a brother until Mark's synopsis reminded me. "If anything, you can almost count “The Darkness Within” as something of a threshold for the series, because beginning here, the show is going to get very violent all the way to the end of season 4. Expect more on-screen impalements, stab wounds and horrible deaths from here on out. Some of these will ultimately test the patience of Broadcast Standards & Practices, resulting in a pulled episode, an unaired episode, and eventually an episode that had to be halted mid-production." Indeed, and what would happen to Insane in the Membrane is a good lesson how a plot episode probably shouldn't be that disturbing in case BS&P actually does decide to stop the episode from airing. Pulling that at the time really disrupted the Mutant Outbreak's on-air momentum/narrative, IMO..., which seems so cute now after some of the airing problems the Nick series' final season had to deal with (a bad enough case of episode airings actually being made to catch up with DVD releases, as in Wanted: Bebop & Rocksteady). We were so spoiled, back when. Perhaps, it's just as well the 4Kids series performed on Fox for as long as it did, as censors were a tad looser in comparison to then-Current Year Kids WB. Which gets odd later in light of the eventual CW merger, Fox dumping their animation block and Back to the Sewer. Feels funny now, as no one was considering any of this, 15 plus years ago. Lastly, I'll say that Mission of Gravity is my favorite Season 3 episode for the reasons Mark outlined, if not in my top 5 all-time favorite episodes. New Blood is a guilty pleasure, if only the Amazonian Blade Bots (hey, I like gynoids). Seemed like it would have been the perfect opportunity to introduce Chrome Dome, instead, in retrospect. Y'know, if the series actually wanted to do that. Anyway, great batch of reviews, as usual. I've never watched this series, so your reviews are always highly appreciated. I caught a small typo; you have a "there" where you want a "their" in the last sentence of the review for "The Darkness Within". Cheers! Keep up the awesome work. Given your glowing reviews of the first several episodes of the Nick TMNT series, what made you ultimately prefer this show?